Facts and history about the life and lifestyles of Native American Indians. American Indian Music is most strongly associated with percussion musical instruments such as drums and rattles. 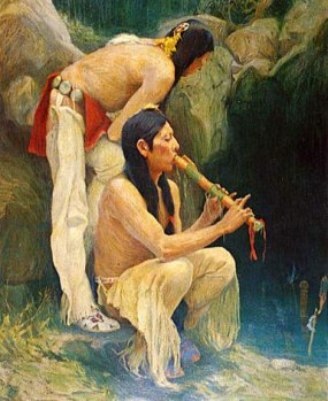 However the tribes used other types of instruments such as the American Indian flute, as shown in the picture, and the Apache tribe developed a type of fiddle. Music played an important role in the tribes and was a fundamental component of American Indian culture and social life. The Medicine Men or Shamans believed that music enabled them to means of commune with the spiritual realm and music was used to bring the aid of supernatural power into the daily life of the people.